Sunland-Tujunga is a community served by two post offices in the northeastern most corner of Los Angeles, California. Though Sunland and Tujunga began as separate settlements, they are today linked through a single police station, branch library, neighborhood council, chamber of commerce, City Council district, high school and various civic organizations. As an example, the Little Landers Historical Society studies the history of the entire area. The merging of these communities under a hyphenated name goes back as far as 1928 with a baseball box score printed in the Los Angeles Times. The two post-office delivery areas are divided by Mount Gleason Avenue, with Sunland on the west and Tujunga on the east. Mount Lukens within Tujunga is the highest point in Los Angeles. 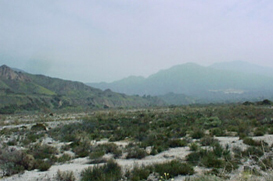 For most of its history, the Sunland-Tujunga valley was described as either rural or semirural. Shadow Hills, a neighborhood within Sunland, is one of the few areas in Los Angeles zoned for horse ownership.